Misleading. The American Academy of Pediatrics shared its findings in a July 2, 2012 press release stating evidence that: Spanking (is) Linked to Mental Illness. The article would have been more accurately titled: Of those with Mental Illness, Only 2-7% Were Exposed to Harsh Physical Punishment based on the data collected by the National Epidemiologic Survey on Alcohol and Related Conditions during the years 2004 and 2005. There is a definite angle to the press release and without reading the entire article, as well as the linked study, one would jump to the conclusion that the Bleeding Heartland blog opined in Evidence mounts against spanking children. However terms are ill defined and manipulated to make the case against spanking in the Bleeding Heartland blog, as well as in the study’s results articulated in the in the press release. The aim of the study was to investigate a possible link between harsh punishment and mental disorders, such as, mood disorders, anxiety disorders, substance abuse/dependence, and personality disorders. The result of harsh punishment, defined by the study as “pushing, grabbing, shoving, slapping, hitting” was increased odds of having an Axis I or Axis II disorder. The following is a description of these type of disorders found in the DSM-IV. Axis I lists most major mental disorders, such as schizophrenia, mood disorders, and anxiety disorders. In general, researchers view these disorders as acute problems that are superimposed on individuals’ preexisting functioning. Axis II lists personality disorders and mental retardation, which ostensibly differ from Axis I disorders in their greater persistence over time. Personality disorders are extremes of personality traits, such as impulsivity, dependency, and anxiety, that are inflexible, maladaptive, or both. Mental retardation is characterized by an IQ (intelligence quotient) of approximately 70 or below, severe deficits in adaptive functioning (e.g., inability to cook or dress oneself), and onset prior to adulthood. The American Academy of Pediatrics findings of “possible link and increased odds” states that 2% to 5% of Axis I and 4% to 7% of Axis II disorders reported experiencing harsh physical punishment. In context of the numbers found in Kessler’s report of 25-30% Americans who sufferer from these disorders, the results are very small. To conclude that “These findings inform the ongoing debate around the use of physical punishment and provide evidence that harsh physical punishment independent of child maltreatment is related to mental disorders” is misleading and erroneous. To make the leap that spanking is the cause of these disorders is also an egregious error, with an obvious agenda tainting the findings of the report. Many have argued, including the American Association of Pediatrics that spanking should not be practiced and they utilize any evidence that helps support their claim. However there are a great many people who have properly and sparingly used spanking as a way of discipline and have children who model the very essence of a well brought up child, secure in the love of his parents and able to live well in society. Clear warning- Your first interaction with your child about a situa­tion should be verbal. It should always be preceded by a clear warning, both for her sake and for yours. You want to know whether your child deliberately crossed a line or made an honest mistake. A clear warning will help her steer clear of danger and will help you know you’re correcting intentional disobedience. 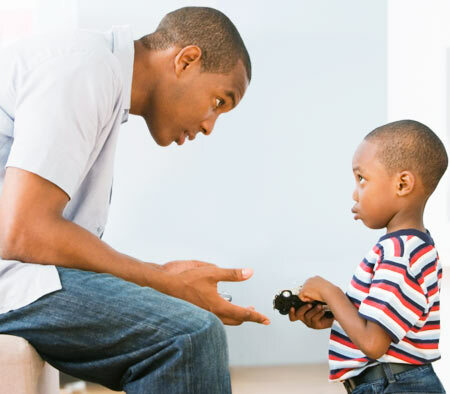 Establish responsibility- It’s important for your child to own up to his misbehavior.Remember that your child can’t learn without being able to own up to his responsibility. No one can. When you put your child in a position of having to do that, you’re preparing him for responsible adulthood. Remember to always keep your focus on the child’s behavior, not his identity. Avoid embarrassment- Never embarrass your children in front of their friends, siblings, or even strangers. Embarrassment can do a lot of damage that you’ll have a hard time undoing later on. Communicate grief– Let your children know that more than being angry, you are disappointed and heartbroken when they disobey. Early on in their lives, let them know that you trust them and when that trust has been violated, they need to know that the relationship is wounded. Provide a sting as a deterrent- Remember the point of a spanking: It’s to sting, to provide a painful deterrent to misbe­havior, not to injure. Sincere repentance– Help them clearly relate the discipline to the behavior, not to them as a person. Tell them how special they are, both to you and to God, and that they were disciplined to correct mis­behavior, not because they were a bad person. If the goal of the study, “Physical Punishment and Mental Disorders: Results From a Nationally Representative U.S. Sample,” was to help those with mental disorders live a well rounded life, or even to determine how actual child abuse can be prevented in these types of living situations and scenarios, then the findings could lead to better ways in which to help this percentage of the population. But the desire and driving motivation came with an agenda and a misinterpretation of the findings. In the authors own words, the reduction of physical punishment and therefore spanking is the desired end. Study authors conclude pediatricians and other health care providers who work with children and parents should be aware of the link between physical punishment and mental disorders. From a public health perspective, study authors conclude reducing physical punishment may help decrease the prevalence of mental disorders in the general population. Once again, all forms of abuse are never acceptable. We should be looking for ways in which to help those with mental disorders. But for the scientific community to make a connection between a possible link and the increased odds of mental illness as related to harsh physical punishment, while manipulating the terms and statistics to push an agenda, is insincere. Spanking has not been proved to be linked to mental illness in this report, but rather the facts were manipulated with the intent to build a case for opponents of spanking. When a child misleads his parents he or she is taught not to lie. When a scientific community misleads the public they too should be reprimanded. Perhaps a spanking is what is needed.